The D.R.K first originated in the UK in 1984 and was first unveiled at the Cheshire Kit Car show in May 1986. As the car proved to be a success D.R.K went into business. The name D.R.K derives from the car’s designers and builders; Derek Callister, Robert Callister and Keith Hamer. The D.R.K is powered by a number of engines ranging from the Renault Four engine to the 1100cc Renault Six and is dependent on what the owner chooses and the donor car that is used. It features an aluminium body mounted onto a wooden frame which in turn is secured to a steel chassis. 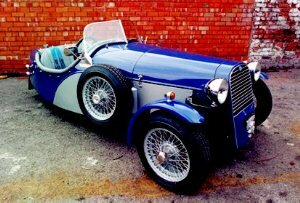 Until 1990 D.R.K’s were built as a spare time hobby but after the business was sold to Callister & Roscoe body repairers, with Derek and Robert Callister being long term partners, the D.R.K went into full production building D.R.Ks to order. All D.R.K vehicles were built to a basic specification but were individually tailored for each customer. They left the factory with a fully built and painted chassis with all the components needed. It was then up to the customer to install a suitable engine and gearbox. Production of D.R.K vehicles stopped in June 1998 after having manufactured 59 cars.